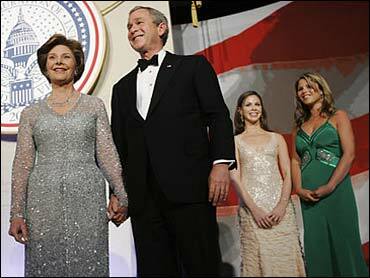 Thursday, Jan. 20, 2005, was probably one of the longest public days of Laura Bush's political life, but from her first appearance at church in the morning, through an afternoon of lunches and parades, and into an evening of inaugural balls, the second-term first lady was the picture of classic elegance. Everyone is talking about the new and improved look of first lady Laura Bush. In this week's People Magazine, we find out why Mrs. Bush is looking so great these days. Patrick Rogers, a senior editor at the magazine, visited The Early Show to explain. It is easy to see the transformation, looking back at the way she looked four years ago when she entered the White House. Back then, Rogers tells co-anchor Julie Chen, Mrs. Bush wore a bright red dress designed to communicate power and occasion, more about the office rather than her as a person. The man who designed that gown was Michael Faircloth, who also designed the outfits worn by the Dallas Cowboy cheerleaders. It was a big contrast between the Faircloth gown and the ice blue Oscar de la Renta gown Mrs. Bush wore Thursday night. This inauguration represents a flat-out attempt to look beautiful and elegant. It shows her increasing comfort with the public, while promoting American fashion and personal style, Rogers says, "She just stole the show in this beautiful gown that was all about Laura, as opposed to being about the first lady." The color of the gown was designed to match the color of Mrs. Bush sapphire blue eyes. "I think she's worn Oscar de la Renta for a long time," Rogers notes. "She used to buy it off the rack. This time around, the clothes were designed for her." De la Renta is a perfect choice for the first lady, Rogers says, "because while he was somebody who designed for Sarah Jessica Parker on the red carpet. He made her look stylish elegant, refined." It seems Mrs. Bush's daughters are partly responsible for the new look. "I think there was some prodding here," Rogers says, pointing out that long gone is the "helmet hair" her daughters used to make fun of. Now it is lighter and, as usual, flawless. "I don't think she's going to be a big fashionista along the lines of Nancy Reagan or Jackie Kennedy, but she has turned the corner between just wearing clothes and wearing fashion," Rogers says. Mrs. Bush, he notes, even has started coming to New York City with her daughters to visit designers, which is not typical of the first lady. And now that her approval rating is through the roof, the first lady is more confortable to wear form-fitting clothing to show off her figure. In fact, her fashion sense is not the only thing that the frist lady has changed. In 2002, Mrs. Bush decided to get serious about her health. She began to work out with a personal trainer and watch the food that she ate. She has lost 20 pounds since she began to get serious about her health. "She did it the old-fashioned way," Rogers says. "She's been working out three times a week: eight-pound weights, a modified yoga and Pilates routine, hitting the treadmill, and also cutting down on the food." Her favorite food is Mexican, and she has tried to only eat it once a week, Rogers says.